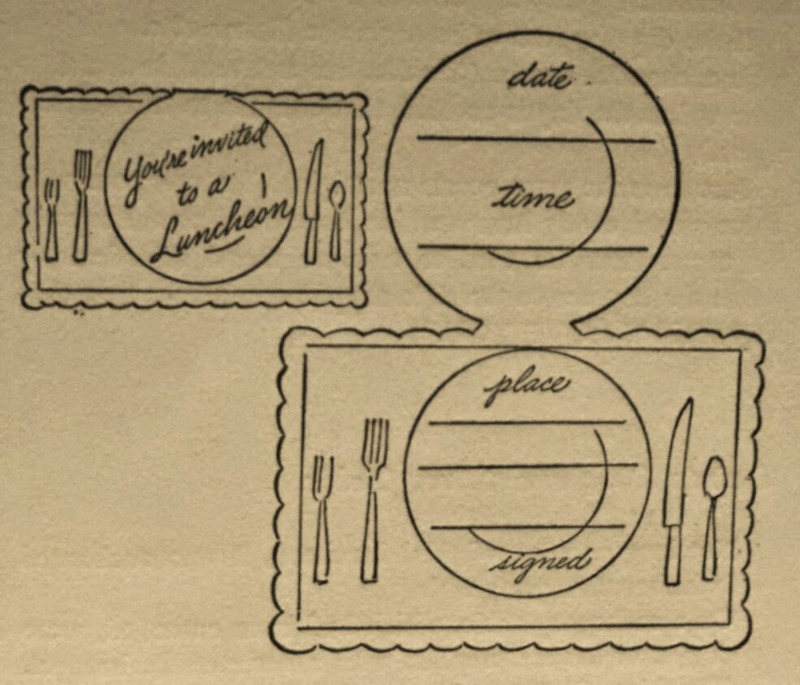 A creative 1950's idea for a handmade bridal shower invitation. We had all said in our hearts there could be nothing new under the sun in the way of bridal showers, hence our astonishment when the morning's mail brought an innocent looking, square envelope containing a folded lace paper doily, on the small, solid center of which was inscribed a formal invitation from Mrs. B., In honor of Miss S.- our bride-elect chum-to a "paper shower." After a round of handmade lingerie, embroidered linen, silk hose, glove and lace handkerchief showers, a paper one came as a blessed relief. Mrs. B's home showed no overelaboration of the paper idea; in fact its first suggestion was in "The Bride's Book" composed of sheets of the young woman's monogram paper, bound in white moire wall paper, tied with a white satin ribbon and charmingly decorated with an outline sketch of the bride (cut from a magazine,) tinted with water colors. His side this volume was a curiosity awakening object; a glass slipper, such as extracts are sold in, tightly stoppered and filled with tiny pink and white candy hearts. Each guest was invited to inscribe her name in the book and record opposite, her guest at the number of hearts in the good-luck shoe. After this pretty ceremony, the guests were ushered into the living room, where to huge hearts of crimson wall paper were lightly laced together to form a bag and this suspended in a bow-window; at a signal, two red ribbons, attached to the points of the bag, were violently jerked, tearing loose the lacings and showering the bride with a fluffy downpour of gifts. The heavier articles were handed to her. I had not imagined paper capable of so many interpretations: there were sets of flower-like candle-shades; a set of individual bonbon holders, made of pill-boxes and cunningly disguised beneath rose crêpe petals; a unique lampshade, of paraffin paper in octagonal sections, each panel decorated with cut-out pictures from Good Housekeeping's "Bride's Primer" and carrying the suggestion that this be used at the bride's first dinner party; two sets of dainty dinner cards and a recipe book. There was a lovely bureau set of boxes, with jewelry case, hairpin box, brush and comb box, all covered with handsome paper in a tiny floral design; there were quite a number of attractive books, some sheet music, boxes of stationary, fans, a waste paper basket and pictures to suit upstairs, downstairs and my lady's chamber. In the dining room the table showed exquisite decorations of pink and white gauze. Tied in true lovers' style on the chandelier the filmy streamers were carried down to the tables four corners and beneath this rosy canopy stood a doll bride, with satin gown, flowing veil, orange blossoms and satin slippers. 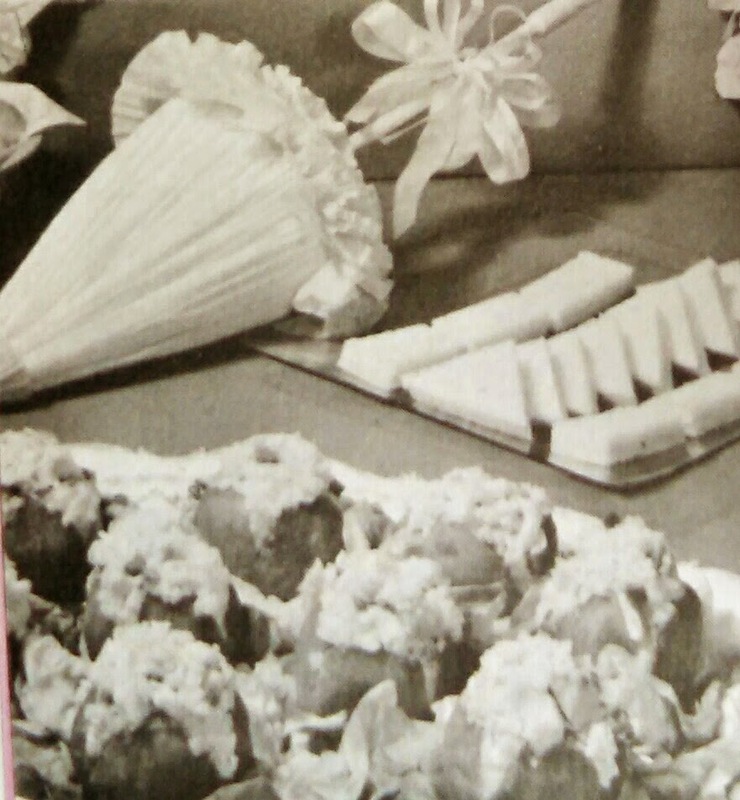 The four little friends who served the refreshments were dressed as flower girls, attendants upon the lady of the decorations and handed salad and dainties. 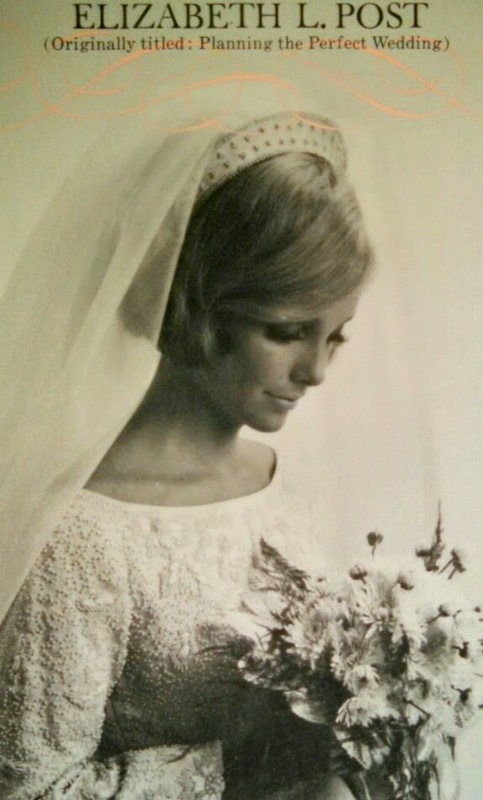 A photograph of the bride was presented to the correct guesser of the hearts in the shoe, and the "Bride's Book" was given to the bride herself. 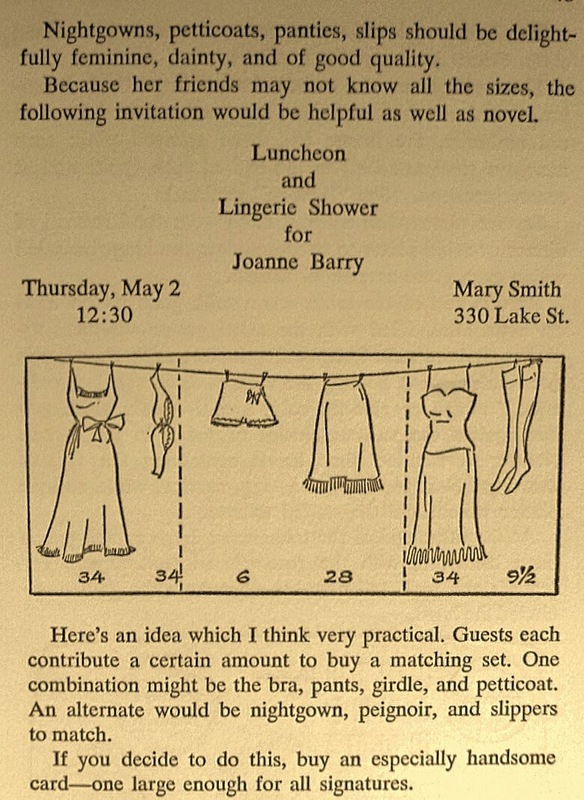 Helpful ideas for a 1950s "Lingerie Shower"
Q. Is it permissible for a member of the bride's family to give a shower? A. No. 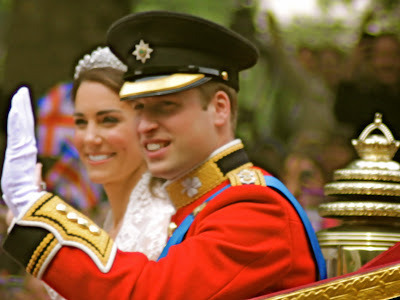 The immediate family of the bride or groom does not give a shower. One exception-if all the guests are relatives. Q. Are the bride's attendants expected to give a shower? A. Often the maid or matron of honor entertains, but not necessarily at a shower. It could be a Tea, Coffee, Luncheon, or Supper in her honor. Q. Are the mothers of the bride and groom included in every shower? Should the bride's attendants be invited every time? A. It's true that the mothers and the attendants are included in a great many showers and other affairs. This, however, many times works a hardship on them financially. No one should be expected to attend more than two, or at the most three, showers for any one person. Q. We are planning a shower for one of our co-workers. Should we include the mothers and bridal attendants? A. If you've planned a party for the office force, don't include others. After all, you all know one another well and will be more relaxed by yourselves. Having members of a specific group or club is a very good idea in that it probably includes girls who might otherwise be left out. One word of caution here: Try to avoid asking just casual acquaintances of the bride. Q. Would it be proper to suggest a price range when extending invitations? A. Yes, that is most sensible. The hostess should discourage expensive gifts. Suggest a price range-say two to four dollars- so that all gifts will be approximately the same value. Although their looks and manners tend to change with the years, the parties for the bride and her attendants are always sparkling, sentimental occasions. The bridal shower, so practical and popular in some communities, is needless for the bride with "the best of everything." 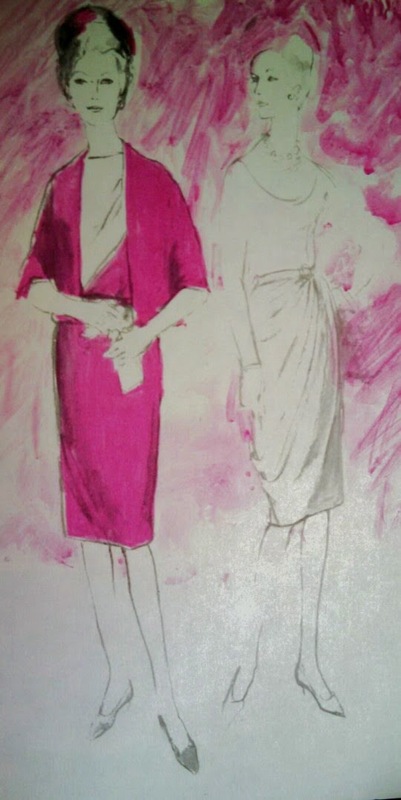 But the charming custom lingers on, often in luncheons for the bride or joint showers for the bride and groom. The setting for a bridal shower is "as you like it"- a luncheon, dinner, afternoon tea, evening snack, or morning coffee; the time: about a month before the wedding. It is usually given by an intimate friend or member of the bridal party; never by the immediate family of the bride. Since everyone who attends must bring a gift, it is considerate for the prospective shower-givers to get together and arrange a single shower when the same friends will be invited. Showers are always gay and fanciful and even more so when the refreshments are ample and attractively served. Shower gifts are usually small and inexpensive and of less importance than wedding gifts. Invitations are either telephoned or written by hand on "informals," but printed stationers' cards are equally proper. Although wedding presents are sent from the shop where they are purchased, shower gifts are always brought my hand and presented personally upon arrival. Frequently, however, the packages are taken at the door by the hostess and placed with the others on the reception table in another room. Gift cards should be enclosed to avoid the self-conscious "That's from me" as each present is unwrapped. When everyone expected has arrived, the bride may then open her packages, one by one, and thank each friend individually. Showers are always gay and fanciful and even more so when the refreshments are ample and attractively served. Coffee and cake, punch and sandwiches, cider and doughnuts are all-time favorites.